This is one of Graze's newer recipes and I'm so glad could fit into my Light Box selection. I adore Thai food so had high hopes for this snack. This is a bit different to my usual Graze nibbles as it's in the form of a soup. However, while it's all packed up into one of the usual Graze packs, it's not quite ready to eat yet. Thai Tom Yum is a teeny portion of this well known Thai soup. It comes with the dried ingredients in the right hand part of the pack with a paste sealed in the left hand side. The instructions tell me to empty the paste and dried ingredients into a mug and add boiling water. Stir and enjoy!. 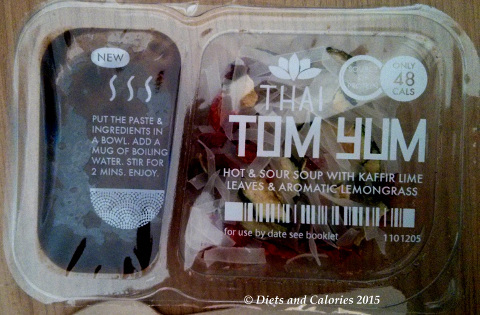 So it’s a little bit like a pot noodle type of thing, but hopefully healthier (and tastier). And the all important calories – just 48. Perfect for the 5:2 diet. 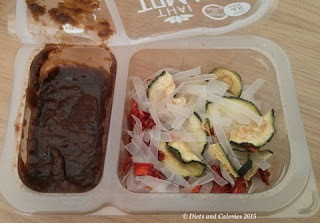 Inspecting the clear packet, there are wafer thin bits of dried courgette and teeny strands of rice noodles. There are lots of dried red bits which must be the red pepper. The paste looks like a thick brown sauce. 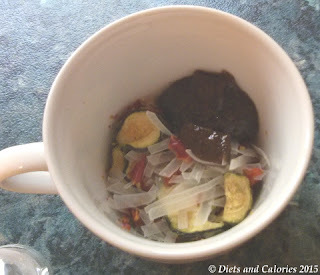 I made my Tom Yum soup in a tea cup rather than a mug and only used half the paste. This was mainly because I was worried about consuming too much salt, plus I wasn’t sure how spicy hot it would be. After leaving the boiling water to do its stuff to the dried ingredients, I sat down to eat. Rather than use the wooden spoon provided, I used a teaspoon. For some reason I can always taste the wood whenever I use wooden implements to stir coffee etc. The noodles, which had appeared scant pre adding the water, were now much more apparent. The taste, while quite spicy, wasn’t overwhelmingly hot. If I’d added the rest of the paste, it may have been a bit too spicy for my liking. So perhaps it’s an idea to add the paste to your own preference. 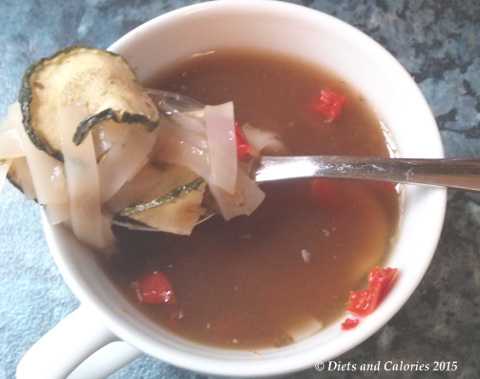 The courgettes and peppers gave the soup a good chewy texture and overall, this little snack felt like quite a filling meal – for a short time. If you regularly eat miso soup, then this is sort of a jazzed up miso soup. And although I liked this, the amount of salt was too much for my linking. Tom yum paste: water, dark soy sauce (water, soy extract [water, soy beans, salt, wheat], salt, glucose, barley malt extract, spirit vinegar), fish sauce (anchovy extract, salt, sugar), coriander (fresh), sea salt, tomato powder, brown sugar, porcini mushroom powder, galangal, garlic puree, lemongrass, tamarind concentrate, vegetable stock (carrot, mushroom, onion, salt, black pepper), citric acid, lime leaves, lime juice concentrate, jalapeno powder. 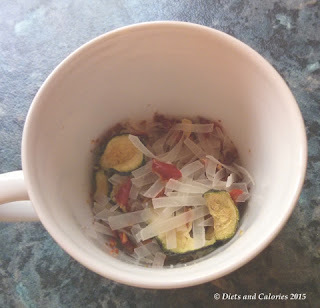 Rice noodle pieces: rice, tapioca starch, water; Red pepper: dried red peppers; Whole courgette slices: dried courgette. Nutrition Information: per punnet: 48 calories, 0g fat, 0g saturates, 10g carbohydrates, 3.1g sugars, 1.1g fibre, 2.0g protein, 2g salt. NOT suitable for vegetarians or vegans. *Health Note: Unfortunately it’s shockingly high in salt. This snack contains 7g of salt per 100g, anything over 1.5g of salt per 100g is considered high. Just this one portion has 2 grams, and the average adult is supposed to have no more than 6g of added salt. The salt comes from the soy sauce and fish sauce mainly, both of which have a high salt content. If you'd like to try out a Graze snack box for yourself, you can order one completely free using this code: CAROLI8RB. All you need to do is log onto www.Graze.com, enter the special code (CAROLI8RB) to unlock your free 1st, 5th and 10th boxes FREE! Then you just select the type of box you want and pick the snacks that you like the look of.